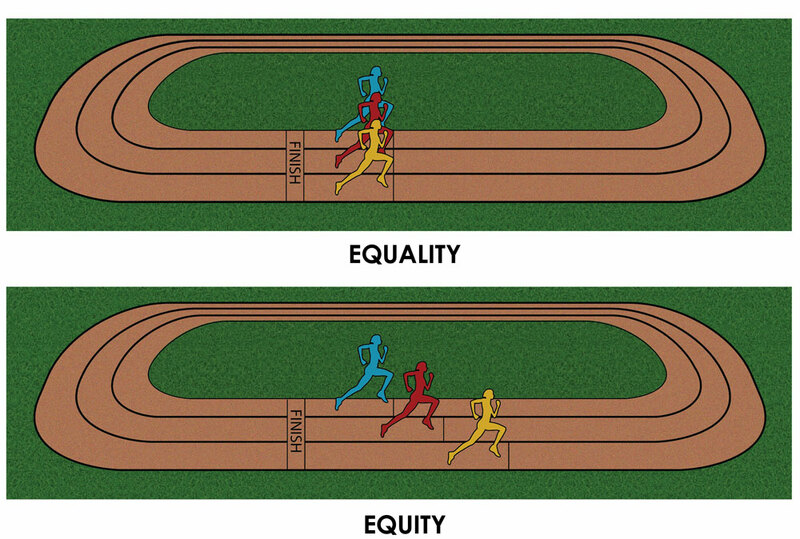 I was doing some work for a colleague at the Family Leadership Design Collaborative, and she gave me a challenge: redesign the “equity vs. equality” graphic that’s been circulating on the web. You’ve probably come across a version of this graphic yourself. There are a bunch of iterations, but basically it shows three people trying to watch a baseball game over the top of a fence. The people are different heights, so the shorter ones have a harder time seeing. I’ve included the original image above, by Craig Froehle. In the first of two images, all three people have one crate to stand on. 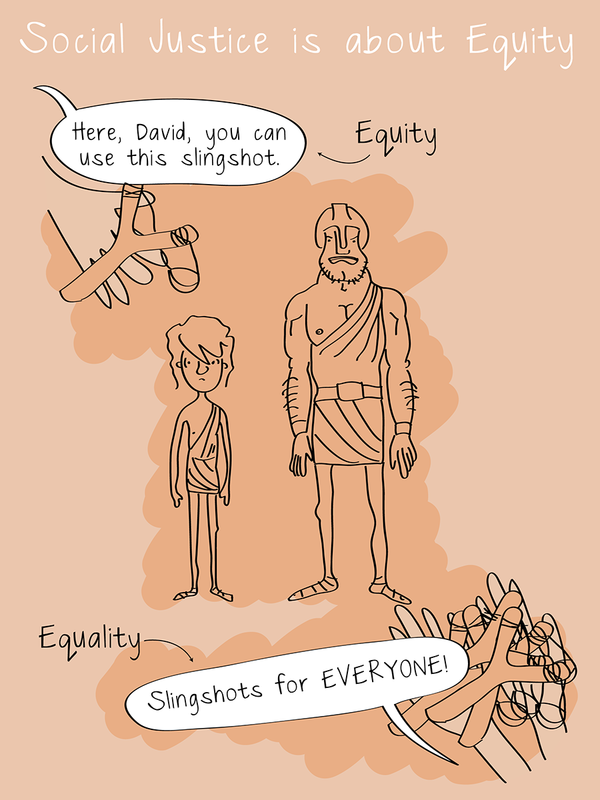 In other words, there is “equality,” because everyone has the same number of crates. While this is helpful for the middle-height person, it is not enough for the shortest and superfluous for the tallest. 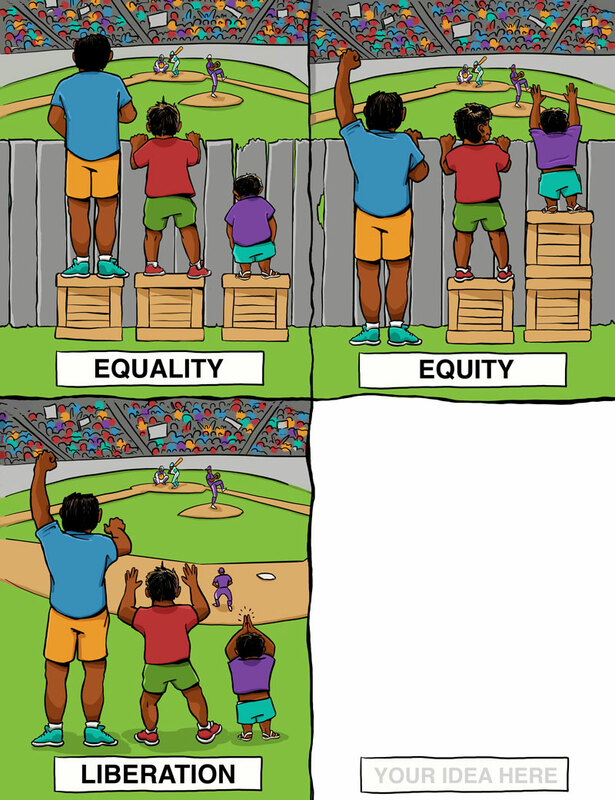 In contrast, in the second image there is “equity” — each person has the number of crates they need to fully enjoy the game. 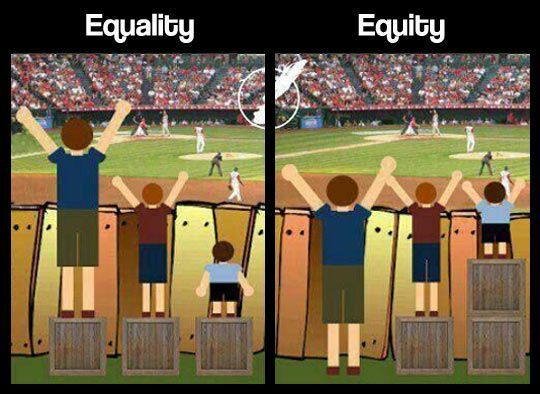 The problem with the graphic has to do with where the initial inequity is located. 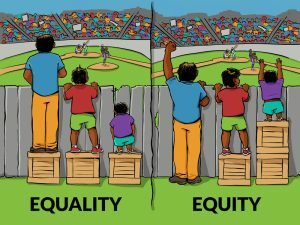 In the graphic, some people need more support to see over the fence because they are shorter, an issue inherent to the people themselves. That’s fine if we’re talking about height, but if this is supposed to be a metaphor for other inequities, it becomes problematic. For instance, if we return to the school funding example, this image implies that students in low-income Communities of Color and other marginalized communities need more resources in their schools because they are inherently less academically capable. They (or their families, or their communities) are metaphorically “shorter” and need more support. But that is not why the so-called “achievement gap” exists. As many have argued, it should actually be termed the “opportunity gap” because the problem is not in the abilities of students, but in the disparate opportunities they are afforded. It is rooted in a history of oppression, from colonization and slavery to “separate but equal” and redlining. It is sustained by systemic racism and the country’s ever-growing economic inequality. This metaphor is actually a great example of deficit thinking — an ideology that blames victims of oppression for their own situation. 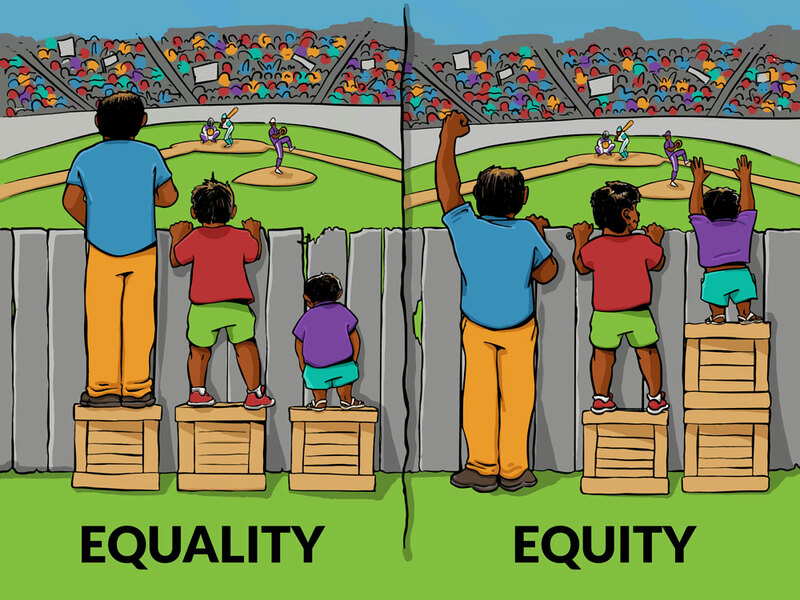 As with this image, deficit thinking makes systemic forms of racism and oppression invisible. Other images, like the one of different animals having to climb a tree, or of people picking fruit, suffer from the same problem. 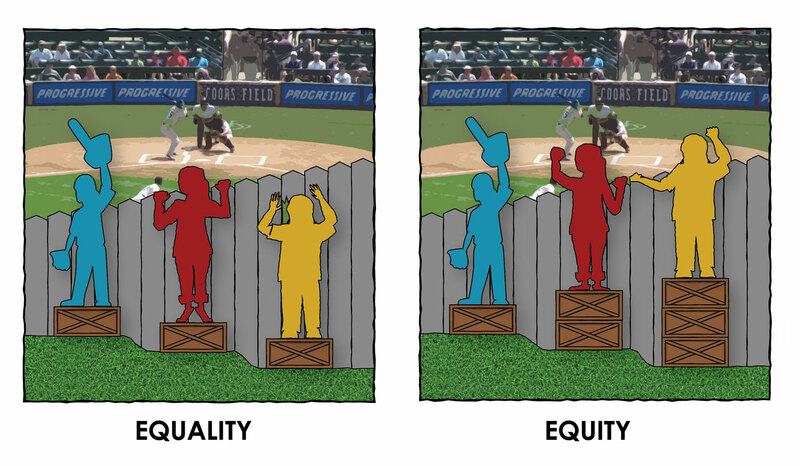 How would we make these root causes more visible in our “equity vs. equality” image? However, I still don’t love this new version, because nothing is being done here to address the real problem: the fence. So I drew this third image for fun. Though by this point it’s losing a lot of the original images nice simplicity. If you want to play around with this metaphor yourself, check out the 4th Box toolkit. Recently, the people at the Center for Story-Based Strategy and the Interaction Institute for Social Change worked with artist Angus Maguire to recreate the fence image, producing the beautiful version to the right. It went viral, and they noticed a lot of people remixing the image to expand on the concepts. So they collaborated with Maguire again to create an adaptable visual toolbox, which makes it easy to create your own image in the “4th box” as shown below. They’ve been using it to inspire both in-person and online dialogues. Beyond this, I haven’t had any major breakthroughs, and the idea of life as a “race” isn’t very appealing to me. Fortunately, I was not the only one trying to figure this out. Meyer Memorial Trust and Northwest Health Foundation had similar concerns, so they launched the Equity Illustrated contest, asking Oregonian artists to take up the challenge. 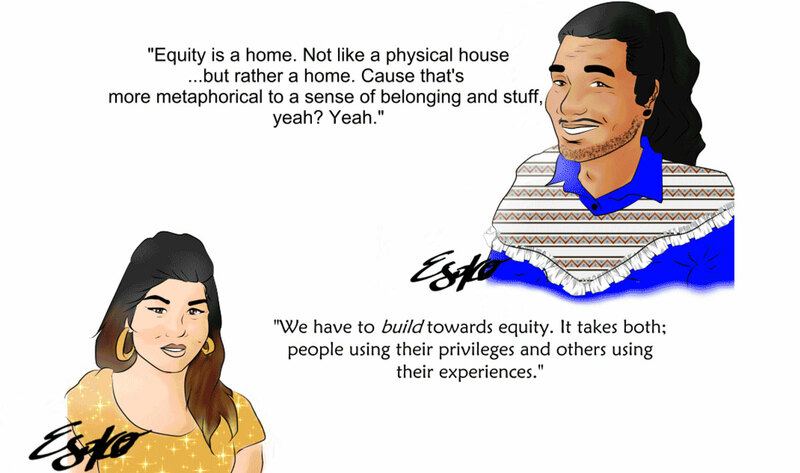 First place winner Salomé Chimuku rejected the simple metaphoric approach all together, noting that “equity isn’t about watching baseball.” Instead she offers a series of cartoon portraits of friends, with quotes from each illustrating a different aspect of equity. The result has the quality of a conversation. Here’s a sample. You can download the whole pdf HERE. The third place illustration, from Matt Kinshella, is also pretty great. 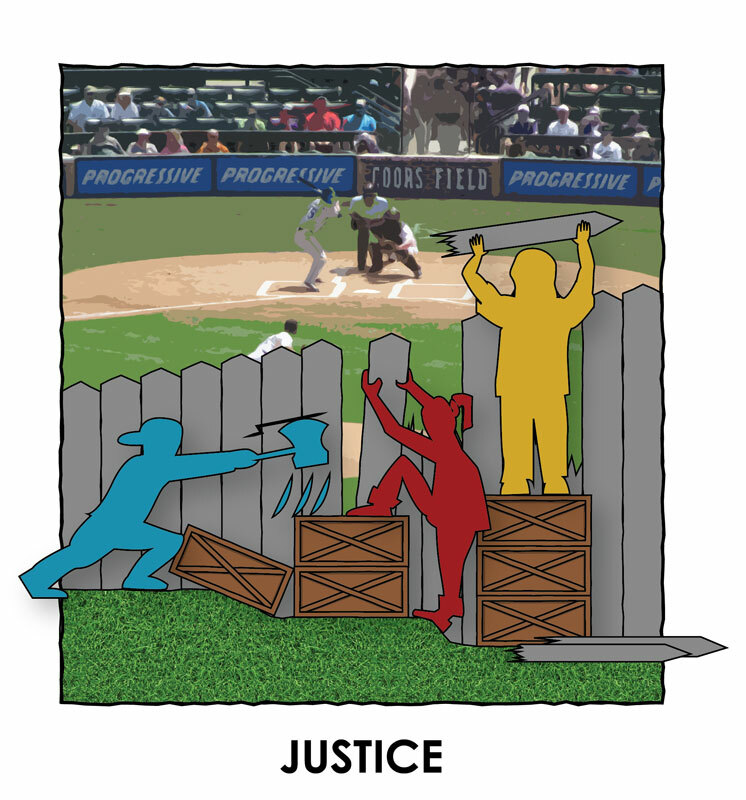 It keeps the simplicity of the fence image, but puts aside the baseball metaphor for a more concrete example — one close to my heart as someone invested in community work. It may seem that I am reading too much into these images. Certainly they were all created with the best of intentions. But metaphors are important. They help us understand new ideas by referencing things we already know. At the same time, they shape our experience, opening us up to some ideas while closing us off to others. 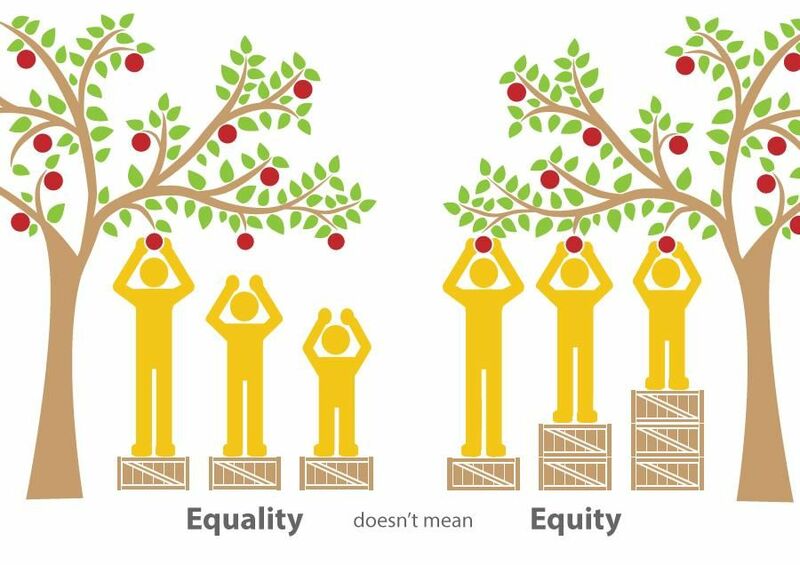 The mental shorthand we use to understand “equity” will affect how we go about fighting for it. In the spirit of keeping the conversation going, I’ll end with this image from Sam Killermann, which I find pretty amusing, and which you can buy in poster or t-shirt form.